Lake Fork businesses face a unique challenge as a large percentage of potential customers are weekenders or visitors vs local residents. Many receive their daily dose of news, weather and event information via facebook, twitter and web sites vs local newspapers. As a business owner it's important to understand how to reach this growing audience and convert them to new customers for your business. 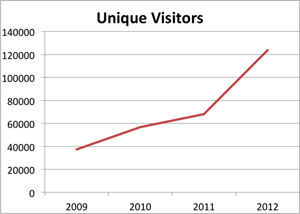 As the most popular online destination for Lake Fork information, LakeForkTexas.com generated over 916,000 page views from 123,000 unique visitors in 2014, up 43% from 2013. During the peak season, nearly 90% of the site visitors originate from outside the area, typically lake visitors and weekenders planning their next trip or real estate buyers seeking their next vacation home purchase. Many of these potential customers are also actively engaged in our community of 7,500 facebook fans. When it comes to online advertising, it's important to maximize your advertising dollar by targeting the sites where your customers visit frequently. Learn where your customers are spending time by googling common area searches and take note of the sites listed at the top of the results. These sites are typically capturing the vast majority of new users. Below are the organic (non-paid) search placements for some of the top Lake Fork search keywords and the related placement rank for LakeForkTexas.com. We've created a wide variety of cost-effective yet highly targeted advertising options to fit any need and budget. None of our options require upfront costs or contracts so you can cancel anytime. You hold us accountable for driving a return on your investment. If we fail then cancel your advertisement and you'll only be charged for the days the ad was active. Our Google Analytics tell us over 50% of users searching for Lake Fork real estate end up on our site. A single real estate listing is always free at LakeForkTexas.com, great for FSBO's or agents with few listings. It also provides a no-risk option to test our service and see if it is right for you. For unlimited listings, we offer a professional real estate subscription for $25/mo which also includes an agent profile page and one "featured" listing upgrade at no charge. Featured listings are rotate on the front page of the site, the main real estate page, the facebook real etate page, weekender emails and listed first in real estate search results. Additional featured upgrades may be purchased at $10/listing/month. There is no contract and you can cancel anytime and only be charged for the days your listings are active. It only takes about 30 seconds when you are ready to post your first real estate listing. Vacation rental listings are $25/month. Featured upgrades, available for an additional $25/mo, rotate first on the front page of the site, the main vacation rentals page and the facebook real etate page. There is no contract so you can cancel anytime and only be charged for the days your listing is active. To create your vacation rental listing, start here. These listings are offered as a service to our visitors so there is no charge. However we do offer a premium upgrade to push your listing to the top of the list with a banner or other display advertisement purchased below. Our display adverting option provides an excellent opportunity to generate visibility for your Lake Fork product, service or entertainment business. Our ads are "run of the site" that rotate equally on every page of the site. Our options range from $25/mo for a small, badge advertisement on the left of the page, to a top banner or premium spotlight advertisement. We'll create the badge or banner for you at no charge. 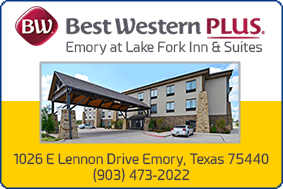 Still have questions about advertising at LakeForkTexas.com? Just Contact us and we'll get back to you asap.